[New for 2018] Oh geez, more new stuff? I went to go check out Minter Wonderland but instead I plowed in to a new Archer Farms product line. At first I thought it might be a second shelf of their new sugar replacement lineup, but I looked closer and definitely noticed new flavors... and they say Non-dairy! I count seven flavors in all. When I went to double check that number on the internet, I discovered that these are being touted as an option for vegans. The flavors are Cashew Caramel, Vanilla Bean, Vanilla Cake & Cookie Dough, Peanut Butter & Chocolate, Strawberry & Fudge, Caramel Brownie, and Mocha Almond Fudge. That's a pretty decent sounding lineup with Vanilla Bean probably scaring me the most. The one that scares me the least? Well, it's the cupcake one. You know what? It doesn't taste that bad actually. There's no milky based creaminess to it, but it's not super dense either. It does feel like I'm scooping ice cream more or less (albeit in a very generic way). I don't pick up any noticeable almond flavoring, but maybe it blends well with the cake flavor? 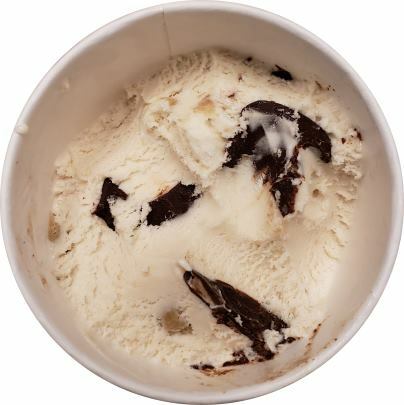 There's definitely a decent amount of cake flavor which will linger until you start hitting the fudge "swirl". I say it that way because they look more like Graeter's chunks then a typical gooey swirl. I ate a bit by itself and the flavor was good but it finished a bit (salty?). 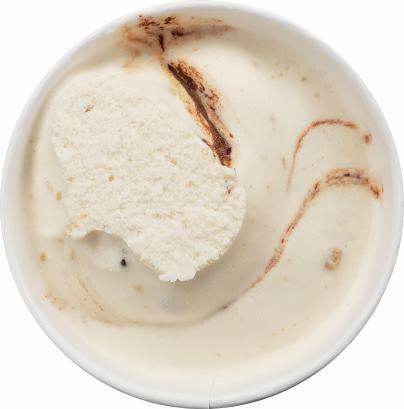 It's definitely a richly flavored swirl. Technically there are cake bits and cookie dough. I think I only got one cookie dough on the first serving so not a ton to say there. The cake bits are a little dry but fun none the less. There's actually one in the picture above, but it's fairly white except for the brownish edge. I'm not sure what's up with the aftertaste. It kind of feels like my tongue is tingly a little bit. I know it's not food allergies, but one of the many ingredients does linger funny (like 15 minutes later and I still feel a little off). Overall a good first impression. It was very easy to keep scooping because of the lighter texture. We'll see how the second scooping goes but at this point I predict trying some of the other flavors as well. (I might be in shock that I didn't hate it). 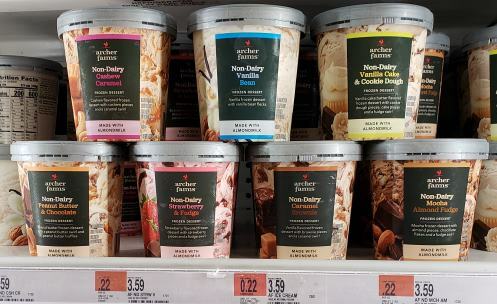 On Second Scoop: I have to give Target props for thinking way outside the box on this particular flavor. Up until now, I feel like most of these almond milk flavors are trying to work with the almond milk. Target says forget that, let's just bury that under a giant heaping of flavor, and it works. Granted I am coming from a position of extremely low expectations, and it's not perfect, but man this one is easy to scoop, especially when that bold fudge swirl kicks in. No, there weren't a ton of cake or dough bits in my second serving, but the base flavoring plus swirl is more than enough to carry the show. Oh, the lighter texture helps too. I know H-D and B&J's mean well with their more dense, non-dairy offerings, but this is more my style. The uniqueness of almond milk is less in your face in a product like this. Good choices made all around (even if some of those choices are monetary based and not flavor based). Nice job Target. Wish I had a closer Target so I could try these (this is the flavor I would have chosen as well). Was the aftertaste still there on the second scoop? Might not be as much of an issue for me as I drink almond milk (and thus am potentially used to it), but the aftertaste is one of the reasons I might dislike the various non-dairy option I've sampled. The swirl tries hard to cover it up. Still there, but definitely bothered me less. I tried the strawberries and fudge kind today. It's awesome! I love how the fudge tastes. I just wish the strawberry had a more fruity flavor- it's a little muted, but not in the way that a lot of other nondairy pints are. I think it's the best nondairy pint I've ever had.